Dimensions 0.50 by 6.75 by 9 in. Is there any sexier topic in software development than software testing? That is, besides game programming, 3D graphics, audio, high-performance clustering, cool websites, et cetera? Okay, so software testing is low on the list. And that's unfortunate, because good software testing can increase your productivity, improve your designs, raise your quality, ease your maintenance burdens, and help to satisfy your customers, coworkers, and managers. Perl has a strong history of automated tests. A very early release of Perl 1.0 included a comprehensive test suite, and it's only improved from there. Learning how Perl's test tools work and how to put them together to solve all sorts of previously intractable problems can make you a better programmer in general. Besides, it's easy to use the Perl tools described to handle all sorts of testing problems that you may encounter, even in other languages. Like all titles in O'Reilly's Developer's Notebook series, this "all lab, no lecture" book skips the boring prose and focuses instead on a series of exercises that speak to you instead of at you. With today's increased workloads and short development cycles, unit tests are more vital to building robust, high-quality software than ever before. Once mastered, these lessons will help you ensure low-level code correctness, reduce software development cycle time, and ease maintenance burdens. You don't have to be a die-hard free and open source software developer who lives, breathes, and dreams Perl to use this book. You just have to want to do your job a little bit better. 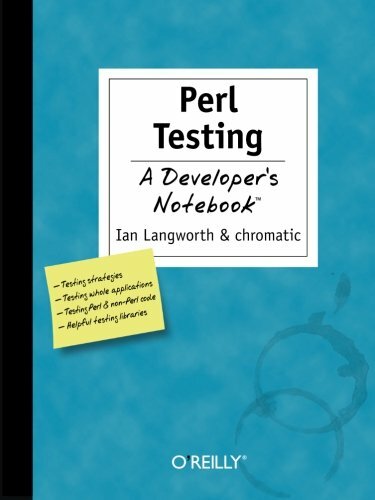 About: Looks at the Perl test tools and offers a series of exercises that cover such topics as bundling test suites, testing databases, and testing Web sites and projects.